While I was away at Yellowstone, a package turned up on my doorstep. 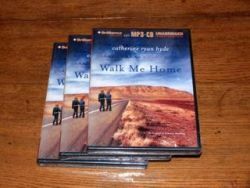 In it were three MP3 audiobooks of my latest, Walk Me Home. Why? Not sure. I had already requested some audiobooks (one or two would have been fine) from my editor and received five CD sets and two MP3 sets. So I gave away three of the five CD sets. I never need more than two of any one edition to archive. So now I have three extra MP3 audiobooks, and it's silly for them to go to waste sitting on my shelf. So, as always, just leave a comment if you want to be in the running for one. Leave your name in the comment form. (Don't fall prey to the mistake of leaving my name because it says "author"--it means author of the comment. That's you.) And leave your email in the space for email in the comment form. That way it won't show publicly. Don't leave it in the body of the comment unless you want everyone to see it. I only need your email address so I can contact you if you win. I don't keep email lists and I promise I won't use it for anything else. Aaaaaannnnddd...the winners are: Lore M, Karen Hambly and Judythe Guarnera. You'll receive an email from me, so watch for that. For Kobo and EPUB people ... a Freebie!